17 September. Fighting breaks out between Indonesians and local Chinese in Medan and Pematang Siantar, in part due to increased local fears of a Dutch return and the wait-and-see attitude of many Chinese. 19 September. Determined to push the Republican cabinet into fully separating itself from the Japanese authorities, who still largely control the city and are now treating with the British, radical pemuda call a mass pro-independence rally in Jakarta’s Ikada Square in the government’s name. They take this action in defiance of Japanese orders and despite the opposition of Sukarno and Hatta, who threaten to resign. With Japanese machine-gunners ringing the square, Sukarno takes the stage and makes a brief public speech appealing to the 200,000-strong crowd to disperse. He succeeds. Involved in events but not appearing in public is the communist leader, Tan Malaka. 30 September. The main body of British troops finally arrives outside Jakarta. It includes a detachment of Seaforth Highlanders, a regiment coincidentally involved in Britain’s first occupation of Java in 1811. Most troops are Gurkhas or Indians; Indian independence leader Jawaharlal Nehru voices a protest the same day about their inclusion in the occupation forces. On entering the city, the troops are soon involved in combating looting, arson and rioting. Four rioters being killed in the first two days. Within a week, the first soldier has been killed. 21 September. Australian troops occupy Makassar as they fan out across Eastern Indonesia and accept the surrender of Japanese forces. Ambon follows next day while Kupang and Banjarmasin were liberated the previous week. Generally the Australians are warmly welcomed, the Dutch NICA officials who accompany them sometimes less so. In Makassar, attempts to bypass the Republican governor and organize pro-Dutch militias quickly lead to violence. 1 October. A range of Karen groups begin a three-day mass meeting in Rangoon to discuss a ‘humble memorial’ that proposes a separate Karen state within the British Commonwealth, to be federated with Burma at a later date. Fears are also aired that the culture and identity of Burma’s ethnic minorities are threatened. Mindful of the savage repression that Karen suffered during wartime resistance to the Japanese occupation and its puppet Burman regime, Karen want to retain their licensed weapons. While prepared to work with the returning British governor, they feel neglected by the British despite their longterm loyalty. This gathering foreshadows the unproductive London meeting in 1946 and the Karen uprising in 1949. 3 October. The Republican Governor of Sumatra, Acehnese lawyer Teuku Hasan, begins to assert his position in Medan. Flag-raisings and the launch of a Republican newspaper accompany this new assertiveness. 18 September. A RAPWI (Recovery of Allied Prisoners of War and Internees) team is dropped on Magelang in Central Java. The despatch of thousands of internees from camps in the region to Surabaya follows. Similar operations are carried out in Sumatra. 19 September. The arrival of a RAPWI team in Surabaya to prepare for the arrival of released internees from Central Java causes local disquiet. When a group of freed Dutch internees with Japanese support then raise the Dutch tricolour outside a central hotel, an angry local crowd attacks them and kills their Dutch leader. The blue stripe is torn from the tricolour, changing it into the red and white Republican flag. 1 October. 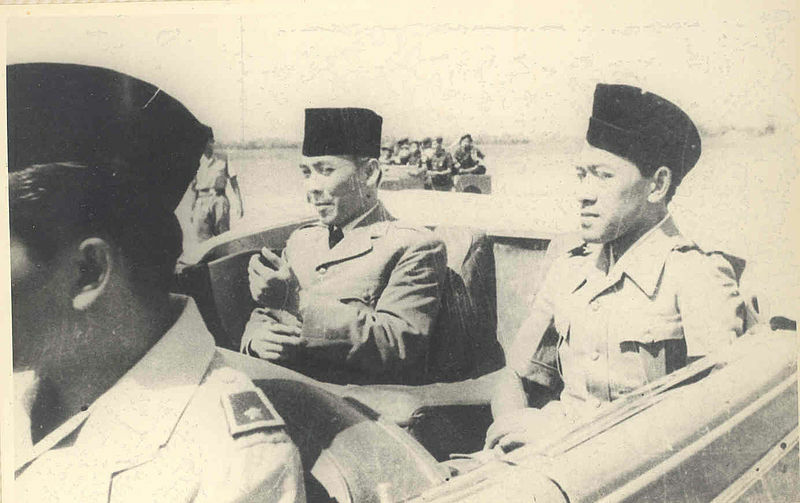 Despite General Christison’s de facto recognition of the new Republic, Sukarno and Hatta are concerned as SEAC troops begin imposing order in Jakarta. Their concerns are hardly lessened by the arrival from wartime exile in Australia of H.J. van Mook, the Lt. Governor-General of the Netherlands Indies. They thus sign a political testament transferring state power to veteran communist leader Tan Malaka in case they lose their ability to function as President and Vice President.